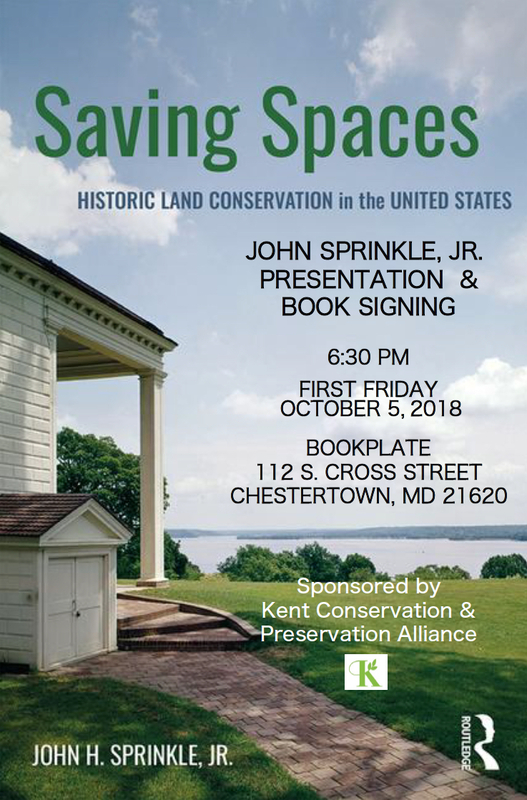 John Sprinkle, Jr., a Kent County native and National Park Service historian since 1989, will deliver a presentation at 6:30 PM Oct 5, 2018 focusing on his new book: Saving Spaces: Historic land conservation in the United States. John holds a doctorate in American history and a masters in historical archaeology from the College of William and Mary. He has previously published Crafting the Preservation Criteria: The Origins of the National Register of Historic Places. The Chestertown 1st Friday presentation will be followed by a wine reception and book signing at the Bookplate, 112 S. Cross St, Chestertown, MD. Join KCPA to hear a historical overview of the struggles to conserve both individual parcels and whole landscapes from being destroyed. Event is free and open to the public.